With Martha's "Big Idea" contest going on at her blog (for Omnimedia employees only!) it got me thinking about some of the "Bright Ideas" I've had - not sure I'd call them 'big' - for the publishing company I know so well. 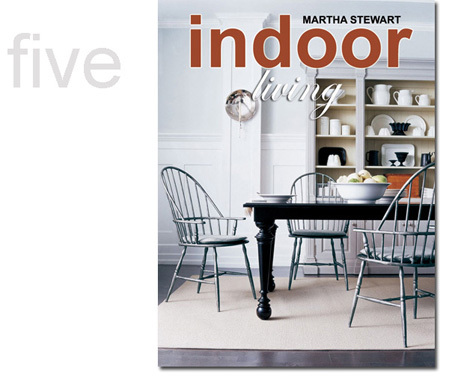 Martha Stewart Living has inspired so many of my ideas, both within the context of concepts for the Martha Stewart brand and outside of that sphere, as a designer, writer and photographer. It's an inspirational company on so many levels. I thought I'd share some of the ideas I've had for Martha Stewart Living special publications, ones that I wish they would come out with. I've always wanted to share these ideas with them. In fact, I've tried. I sent a large portfolio of these very designs to Omnimedia in New York only to have it returned to me with a long letter saying they cannot accept - or even look at - ideas from outside 'contractors' unless they are under the 'Omnimedia umbrella.' In other words, they would be violating their own corporate governance rules if they considered ideas from people who were not on contract with them. My thinking: "How do I convey how much I'd love to work for them, and SHOW them what I can do for them, if they cannot view my ideas for them?" It's a conundrum I'm still struggling with, actually. But there's nothing that says I can't put these images on my blog and explain to everyone else what they're all about. Maybe someone from Omnimedia is reading - maybe even Martha - and will decide to snap me up and give me that contract! A SPECIAL ENTERTAINING ISSUE, similar to the one they released for the turn of the millennium, would be welcome. 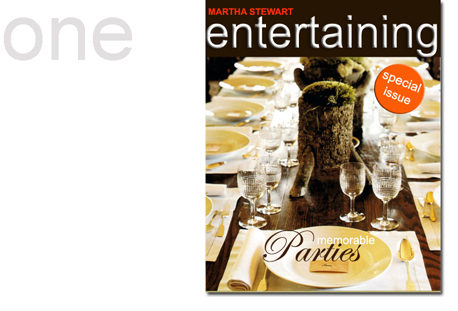 This one would be a compendium of all the best entertaining ideas that have been featured in the magazine. For the cover I chose an image of the table set at Skylands. I've always admired Martha's unusual centerpieces. I kept the design simple and modern, but with a classical bent. 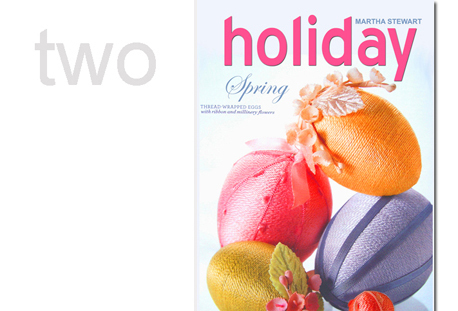 SPRING HOLIDAY ISSUE: Who says the special Holiday issues have to always be about Halloween and Christmas? There are spring celebrations that are worthy of a special issue, too: Easter, May Day, Passover, Mother's Day. All of these, and more spring ideas, such as spring birthday cakes, garden tips and ideas for entertaining outdoors, would be featured in the magazine. For the cover I chose a beautiful image of silk-covered eggs, keeping the simplicity in line with the other Holiday issues that have come out recently. 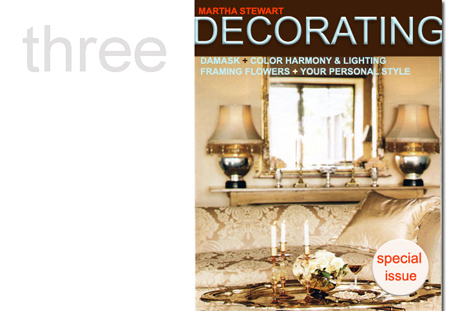 A SPECIAL DECORATING ISSUE, similar in design to the aforementioned Entertaining issue, would feature the best decorating ideas and how-to instructions from Living. Tips on furniture layout, features on collecting, choosing curtains and colour schemes, caring for houseplants, arranging flowers and maintaining a consistent 'look' in a room would all be discussed. I'd lay it out by room (living room, dining room, kitchen, bedroom, bathroom) so that it would be easy to navigate. SPECIAL REMEMBERING ISSUE: This one would be a collection of all of Martha's "Remembering" columns from the older issues of Living. It would be a collection of personal reflections on her family, on her hobbies, her best tips and a reflection of her style. It would contain never-before-seen personal photographs as well photos from past issues of Living. It would contain her favourite recipes and her favourite sources. Basically, it would be fabulous. INDOOR LIVING: This one is very tongue-in-cheek. It's a measured, humourous response to the Outdoor Living issues that have been released this year and last year. For the font colour I used the colour of the tray on the shelf display. The image is from her catalog of furniture from the Lily Pond collection. 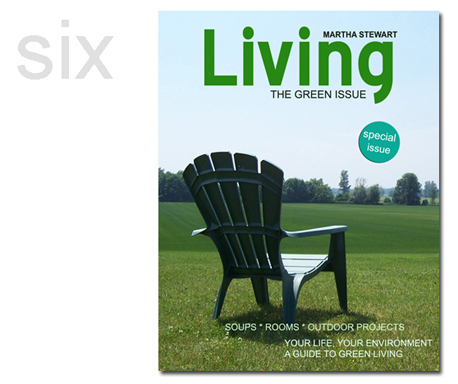 SPECIAL GREEN ISSUE: I've never seen an issue on newsstands about how to live a 'green' life: an environmentally sound existence that doesn't promote wastefulness in any way. This issue would contain ideas for composting, reducing your electricity consumption, feature houses that are state-of-the-art in terms of energy use and design as well as tips on how to grow organic vegetables in the garden, treat your garden with as few chemicals as possible and basically reduce your carbon footprint. I used my own photograph for the cover. ALEXIS MAGAZINE: I think a magazine by Alexis Stewart, Martha's daughter, would be a fun and fancy endeavor. It would have her personality all over it: dry, sardonic, sarcastic with lots of humourous articles about how to avoid family get-togethers, with reflections on some of her memories growing up with Martha. It would also have tips on vegetarian cooking, creating a minimalist space and how to bake beautifully. I used an image of Alexis from a feature that ran in a fashion magazine. The design is bold and clean, like Alexis herself. So, I'll expect Martha's call! Like your Alexis idea the best! Brilliant! I really enjoy reading your blog on everything Martha. Great Stuff! I enjoy looking at your martha collection. I too have been emailing MSLO about putting out special issues. I want to see a Holiday Easter/Spring issue too or and issue all about Eggs & an issue all on Glitter similar to the goof she had on a past show. I really enjoy reading your blog on everything Martha & MSLO. Good work. I too have been emailing MSLO about doing specials issue like a Holiday Easter/Spring issue or and issue all on Eggs and maybe a issue all about Glitter. Like that goof issue she did on a past show where everything is glitter. Keep up the fun stuff. Have you considered sending you ideas directly to Gael Towley or Kevin Sharkey rather than a mailroom clerk? I think I have email address for both of them. I like the idea of a Remembering mag, filled with Martha's reminisences. Maybe a complilation from all of those back-of-the magazine columns in MSL. Least fave would have to be Alexis - what's she ever done, but be "Martha Stewart's daughter"? At her age, she should have actually accomplished something. Andrew, I have magazine binders filled with MSLO publications. I can't bring myself to cut or tear the articles/pictures. Your ideas are quite simply Brilliant! You should soooooo work for Martha!